The District is required by Act 34 of 1973 to hold a public hearing on the proposed construction of any new facility in the District. This law requires that the Board hold a special meeting to provide the community with an opportunity to view the plans for the new construction and make public comments regarding the project. 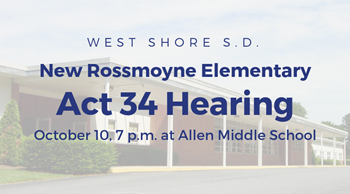 The public hearing for Rossmoyne Elementary will be held at Allen Middle School on October 10, 2018 beginning at 7 p.m. Members of the public are invited to attend and will have the opportunity to offer comments and ask questions. In addition to the hearing, with the help of the architects and its financial advisors, the District is sharing the attached Act 34 Booklet for Rossmoyne Elementary with the public for review.